The Progressive Economics Forum » Are average Canadians paying too much in taxes? The Fraser Institute’s report claims that the total tax bill of the average Canadian family now takes up 42.7% of their income and has increased by 1,787% since 1961 (without adjusting for inflation). These are big numbers, but when we look closely at how how they are constructed, it becomes clear that the Fraser Institute doesn’t even come close to measuring the tax bill of what most people would think of as the average or a representative Canadian family. 1. The representative/ordinary Canadian family does not pay for the average (or mean) business taxes levied in the country, not does it pay for the average (or mean) personal taxes. With income distributed so unequally and highly concentrated among the top 1% of Canadians, the average tax bill is a meaningless mathematical construct. 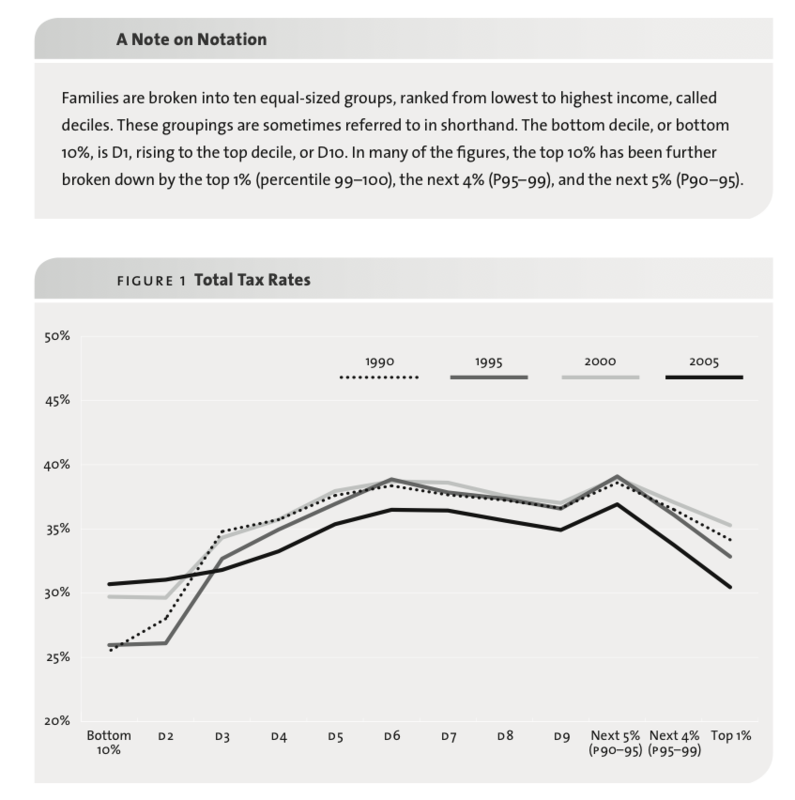 For example, research shows that most, if not all, of the business tax bill falls on investors (not workers) and given how unequally distributed shareholder profits and investment earnings are these days, the average has become meaningless â€” itâ€™s artificially pulled up by those with higher incomes and does not represent the experience of most families. Taking the average (mathematical mean) doesn’t make sense when talking about personal income taxes, which are progressive, with rates that increase with income. For example, both main parties running for government in BC’s May 14 election have proposed a tax increase on incomes over $150,000. This tax increase will only affect the top 2% of British Columbians, while 98% of us will not see our taxes change. Yet, a future year Fraser Institute Consumer Tax Index report will be showing a small increase in the average family’s tax bill with their current methodology. 2. Even if we overlook the distributional issues and accept the Fraser Instituteâ€™s numbers, knowing that the average family pays a higher percentage of its income in taxes today than the average family paid in 1961 doesnâ€™t answer the question of whether this is too much or too little. We need to take account of what Canadians get for their taxes to make that kind of judgment. The Fraser Institute report, however, completely misses this part of the equation. In addition to providing services, a large chunk of governmentâ€™s tax revenues flow back to Canadians in the form of direct transfers, such as old-age pensions for our elders, EI payments for the unemployed, and child benefits for parents. The Fraser Institute includes government transfers in their calculation of family income, but you wonâ€™t find this out in this edition of the report â€“ you need to look up a 2008 Fraser Institute book that is cited in the report to get at their definition of family income (or family cash income, as they call it). Well, I did, and I found that family cash income includes wages and salaries, but also unincorporated non-farm income, interest, dividends, private and government pension payments, old age pension payments, and other transfers from government. Without getting into a discussion of what percentage of Canadian families receives income from dividends and other investments, and how meaningful averages are when the distribution is so unequal, letâ€™s just note that old age pension payments and other government transfers account for a large share of the average familyâ€™s cash income. In 2007, the latest year for with Fraser Institute numbers are available, they estimated that the average family received $2,125 in old age pension and $8,344 in other government transfers, for a total of $10,469 or 16% of their â€œcash incomeâ€ of $66,496. On average, then, almost half of the familyâ€™s total tax bill came back to them in the form of direct transfers from government. The other half was used to pay for services like education, healthcare, policing, justice, road construction and repair that Canadian families used and benefited from. This doesnâ€™t seem like such a bad deal, after all. It’s curious that the Institute decided not to publish this part of their calculation since the 2008 edition of the report. The main tax issue facing Canada isn’t that average Canadians are paying too much taxes, but that high income Canadians and profitable businesses are paying too little. For more on that and how to fix it, see this recent CCPA tax reform report I co-authored with Marc Lee. It’s not a technical inaccuracy exactly, but it’s pretty damned silly for the Fraserites to highlight two figures that are counted in completely different ways. First, they claim people’s tax bill has increased 1787 percent (in nominal dollars), which is a ludicrous figure to talk about in the first place. Then, they talk about people’s tax bill now (but not back then) as a percentage of their income. The two measures are totally irrelevant to each other. But trotting them out right next to each other without context or much impression what they apply to, it does give the impression, if you’re thinking little enough to be impressed by the 1700% figure, that somehow in those halcyon days of 1961, we must have only paid like 2-3% of income on our taxes. Stupid propaganda tactics. great piece. Read it after writing my own take which is up on Economy Lab today. Great work from all of you. The one thing that I think Canadians do not think enough about, like Andrew mentioned, is how far our public services have come since those old days of lower taxes. Those public services are from a distributional consumption based aspect favour those with less income. In a privatized world, those with higher income could easily afford to pay. So I do find that what is missing in the public psyche is that connection between public service provision and the amount of taxes paid. Imagine if all these services were all privatized what the costs would be for individuals? And don’t think for a moment the wealthy and the foreign based multinationals that pay little taxes, do not know this- the have the discourse firmly shaped and the political culture ground to exact specifications into delusional tea party angst and tax backlash. I agree Canadians are paying more taxes. Statics Canada tells us that 1% is paid on the average 33% of their income in the Federal and provincial income taxes while 90% paid average of 12% of their income. But also we should forget that government revenues flows back to Canadians in the form of direct transfers such as old age pension, EI payments and Child benefit all these help Canadians in ne way or the other. in otherwards is it fair for for business owners to pay low taxes while other Canadians pay high?